A place of honour to one, a place of prayer for all. Three new entries have been posted on the events page. The Honoris (Latin for place of Honour), was founded to promote the cause of our Venerable Founder both in our order and in the faithful in general. It is located in the Grotto of Saint Patrick's Basilica, Ottawa, Ontario, Canada. The Honoris is to make our fellow Knights and the public aware of the life and works of the Venerable Founder of the Knights of Columbus and from this to create devotion to and for him to advance his cause. The Venerable Michael McGivney Honoris members pray daily for the souls of all the departed. Please send in the names of your deceased relatives and friends to our Honoris. Click to send this to us by email. As of May 1st, 2018 all deceased and future deceased on our Memorial Page are enrolled for daily Masses. The stipend for this comes out of your contributions. This is a way that we can show our appreciation for your prayers and support. 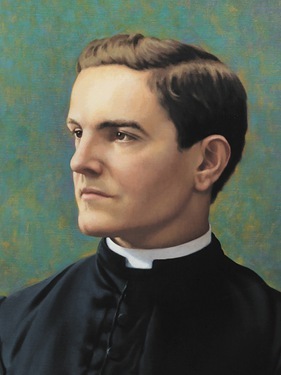 Father Michael J. McGivney was born in Waterbury, Connecticut, on August 12, 1852. His parents, Patrick and Mary (Lynch) McGivney, had arrived in the great 19th century wave of Irish Immigration. Mary McGivney gave birth to 13 children, six of whom died in infancy or childhood. Michael, first born, with four sisters and two brothers, learned early about sorrow and the harsh grip of poverty. He also learned about the power of the Love and Faith as well as Family fortitude. As a child he went to the small district schools of Waterbury’s working class neighbourhoods. He was recognized by his school principal for his excellent deportment and proficiency in his studies. He left school at the age of thirteen to work in a brass factory to help support his family survival. When Michael reached the age of sixteen in 1868, he left the factory, with the priesthood clearly in mind. He travelled with his Waterbury Pastor to Quebec, Canada. There he registered at the French run College of St. Hyacinthe, where he worked hard to prepare himself for the seminary admission. Two years followed at Our Lady of Angels Seminary, in Niagara Falls New York. Young McGivney moved next to Montreal, Quebec to attend seminary classes at the Jesuit-run St. Mary’s College. It was when he was at St. Mary’s, that his father died in June 1873. Lacking funds and concerned about his family, he went home for the funeral, lingering a while in Waterbury. Then at the request of the Bishop of Hartford, he entered St. Mary’s Seminary in Baltimore, Maryland. After four years of study, on December 22, 1877 he was ordained in Baltimore's Historic Cathedral of the Assumption by Archbishop (later Cardinal) James Gibbons. Father McGivney began his priestly ministry on Christmas Day in 1877, as curate of St. Mary’s Church in New Haven Connecticut. It was the city’s first parish housed on the finest residential street. So Father McGivney's priestly ministry in New Haven began with tension and defensiveness among the working-class Irish families he served. In 1881 he began to explore with various laymen the idea of a Catholic fraternal benefit society. In an era when parish clubs and fraternal societies had wide popular appeal, the young priest felt there should be some way to strengthen religious faith and at the same time provide for financial needs of families overwhelmed by illness or death of the bread winner. He discussed this concept with Bishop Lawrence McMahon of Hartford and received his approval. He travelled to Boston to talk with the Massachusetts Catholic order of Foresters and then travelled to Brooklyn to consult with the Catholic Benevolent Legion. He also met with other priests of the diocese and sought information that would help the catholic laymen to organize themselves into a benefit society. William Geary, one of the orders’ charter members, said at the first council meeting in 1882, Father Michael J. McGivney was acclaimed “Founder” by 24 men with hearts full of joy and thanksgiving, recognizing that without his optimism, his will to succeed, his council and advice, they would have failed. Father McGivney had suggested “Sons of Columbus” as a name for the order. This would bind Catholicism and Americanism together through the faith and bond vision of the new Worlds discoverer. The word “Knights” replaced “Sons” because key members felt it would apply noble ritual in support of the emerging cause of Catholic Civil Liberty. On March 29, 1882, the Connecticut Legislature granted a charter to the Knights of Columbus, formally establishing it as a legal corporation. The Order’s principles in 1882 were “Unity and Charity”. The concept of “Fraternity and Patriotism”, were added later. In April of 1882 Father McGivney with the permission of Bishop McMahon, wrote to all the pastors in the Diocese of Hartford and urged each pastor to exert influence in the formation of a council in each parish. First officers of San Salvador Council No.1, in New Haven, Connecticut, were installed in May 1882. By May 1883 Council No.2, had been instituted in Meriden, Connecticut. Bishop McMahon was so impressed with the organization, that he became a member of council No.11 in 1884. By the end of 1885, there were 31 councils in Connecticut. Never robust in health, Father McGivney was suddenly stricken with a serious case of pneumonia in January 1890. Various treatments for consumptive illness were tried but his decline persisted. The young priest lost physical strength just as the Order he founded was moving toward new vitality. On August 14, 1890, Father Michael J. McGivney died at the age of 38. In his 13 brief, busy years as a priest, Father McGivney's piety and compassion has won the love of those he served as curate and pastor. Remarkably developed from its simple beginnings in a church basement, the Knights of Columbus today combines Catholic Fraternalism and one of the most successful American insurance enterprises. The four towers of the international headquarters symbolize the Order’s worldwide commitment to charity, unity, fraternity and patriotism. In 2012, there were over 13,000 fraternal councils, active in 13 countries. The Knights of Columbus is the largest Catholic Fraternal organization in the world, comprises of over 1.9 million members. 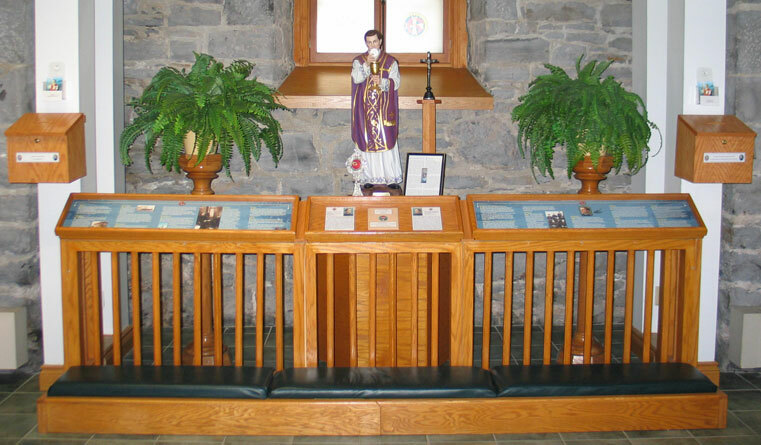 At St. Mary’s Church in New Haven, Father McGivney’s sarcophagus, sheltered inside a totally restored church, now has become a shrine for pilgrim Knights where the Order began.